This kit is for the advanced DIY crowd! Looking for a simple prop animation kit? We put this kit together to give advanced prop builders the option to create their own prop turners without buying a complete unit. This kit includes all of the essential parts to build a smooth running and dependable mechanism. You supply the motor of your choice and mounting platform. 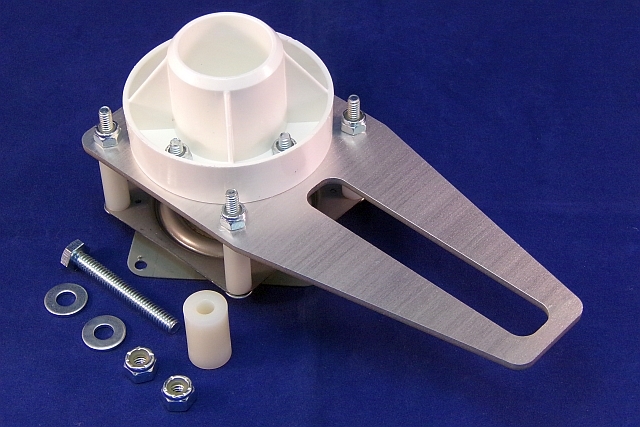 This kit includes the same quality parts and hardware featured in our Compact Prop Turner and Watchman animation kits. The turning assembly rides on a 3 inch swivel bearing that is rated at 200lbs of down force and the base accepts 1 inch PVC pipe for easy connection. It can be made to accept 3/4" or 1/2" PVC with the addition of a reducer fitting. The kit also features a low friction nylon roller for quiet operation and long life. (1) Assembled prop turner bearing and drive arm assembly. (1) 2" x 1/4" tap bolt. (2) 1/4" x 20 nylon insert lock nuts. (2) 1/4" SAE flat washers. Horizontal mounting only! Mounting surface must be level to keep components properly aligned. The "spine" must be supported above the unit to prevent side loading of the bearing! Failure to do so will cause binding and premature failure. Q: is that motor 110 volt? Q: Does the arm for the electric motor come with this kit? Thank you.